We can't get enough garlic in our house so any recipe calling for good amounts of it are welcomed in my kitchen! This recipe starts out with seasoning bite sized pieces of chicken breasts with garlic powder, salt and pepper. The chicken is browned on SAUTE mode using my Instant Pot, which is then deglazed with white wine and lemon juice. The dish simmers a bit before adding the colorful bell pepper and onion slices. 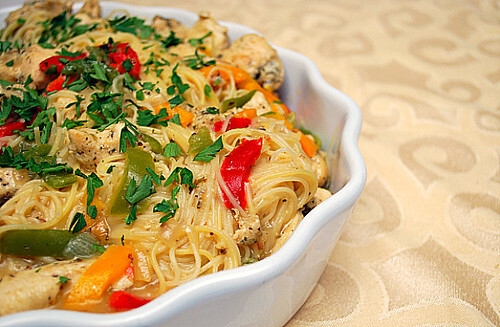 We've loved this dish tossed with angel hair pasta, just as they do at Olive Garden. However, another alternative is serving this over rice or even mashed potatoes. Press SAUTE on the IP and heat the butter and oil over medium high until the butter melts. Add the chicken to the skillet along with garlic powder, onion powder, salt and pepper to taste. Cook chicken until lightly browned. Once chicken is browned, deglaze the IP by adding the white wine, lemon juice, Italian seasoning and fresh parsley; stirring to pick up any bits on the bottom of the skillet combine. Allow the chicken to simmer for 10 minutes. Add sliced peppers and onions and cook for an additional 7-10 minutes until peppers are tender. Serve tossed with buttered pasta (such as angel hair), over rice or with potatoes and garnish with additional fresh parsley. Not sure why using the instant pot for this recipe offers much - you just use the saute feature, so could use a saute pan as well - or did I miss something? Thanks Adam for your comment! We recently made this for our family camping trip and used our Instant Pot at the cabin. 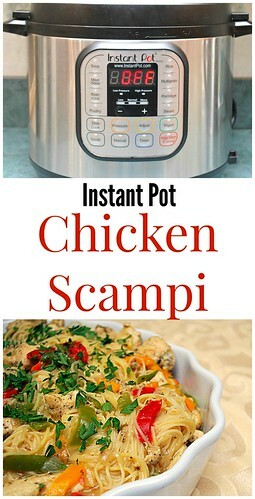 Although it doesn’t specifically require pressure cooking to make this Chicken Scampi recipe, the ability to make it in the Instant Pot was worth sharing. We also prepared the angel hair pasta that we served the scampi wth in the Instant Pot! SO STOKED TO FIND THIS!